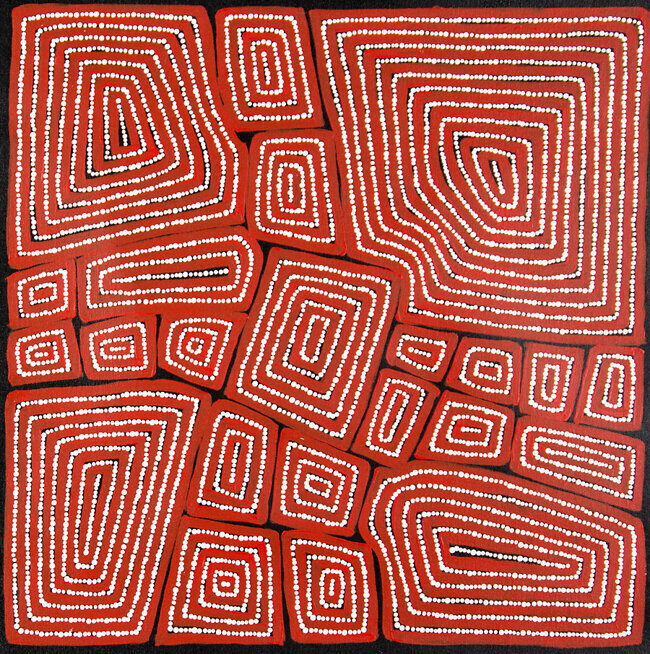 Thomas Tjapaltjarri was born in the Gibson Desert in the early 1960's and is a member of the Pintupi tribe. The sensation in October 1984 was when Thomas and eight other members of his tribe walked out of the desert from the ‘Stone Age’ into the 20th century. While all the other Aboriginals in the area were being settled on government stations further east, their small family group escaped the net. They continued to live the traditional aboriginal life of nomadic hunter-gatherers. They had no contact with the modern world of 'white' twentieth-century Australia until 1984. It was then that they were 'found' by a party from a recently re-settled aboriginal outstation at Kiwirrkuru. The discovery created international headlines. It also created a new life for the wandering tribe. In 2000 -2002 he started to paint. 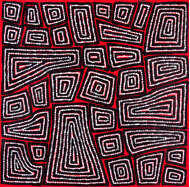 His brothers, both very famous artists, Warlimpirrnga and Walala, inspired him to do so. 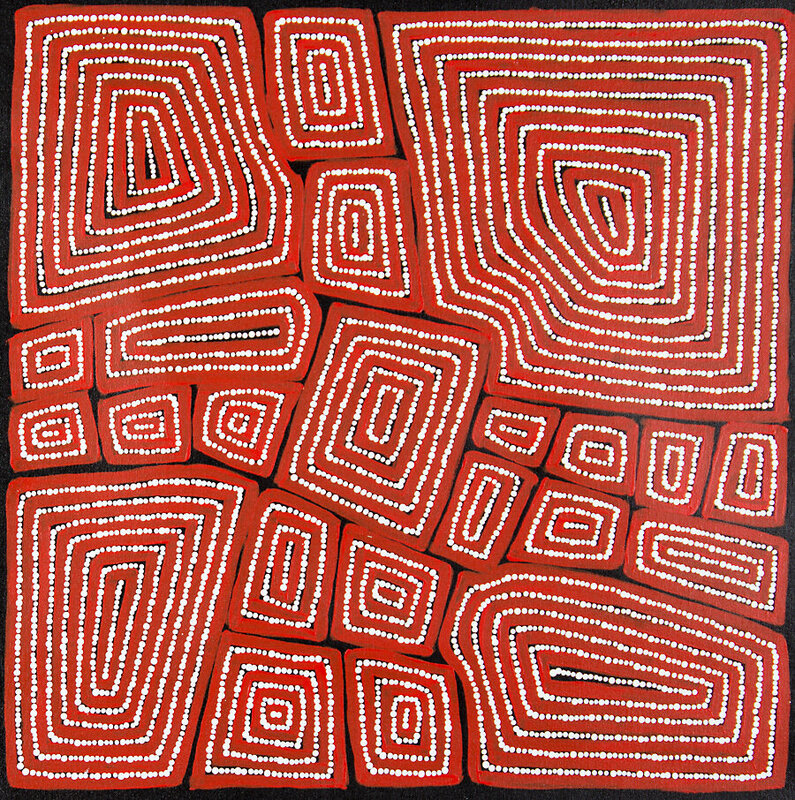 The subjects of his painting are the Tingari Cycle, a series of sacred and mythological songs connected to his birth ground. 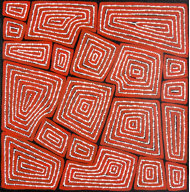 His Tingari Cycle paintings are associated with the artist's Dreaming sites located throughout the vast sandhill country of the Western Australian desert. It was at Kiwirrkuru that Thomas began to paint on canvas, setting down the stories and images of an unbroken cultural tradition stretching back tens of thousands of years. This style is characterized by its rectangular shapes and lines surrounded by dots. The strength of his work was recognised at once and is very popular today. His style is strongly gestural and boldly graphic, one that is generally highlighted by a series of rectangles set against a monochrome background.